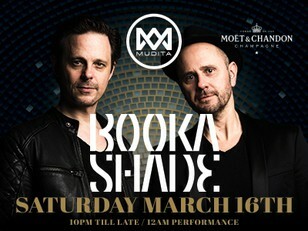 We are thrilled to announce that celebrated German electronic duo, Booka Shade will be coming to Mudita on the 16th of March to give us an incredible live set experience. Get ready for a great night of house & techno. Get your advance tickets today! Booka Shade kicks off 2019 by joining forces with Kaktus Einarsson from Fufanu for a new single on their imprint, Blaufield. Premiered by Pete Tong on BBC Radio 1, ‘I Go, I Go’ features Kaktus Einarsson’s emotive vocal contributions united with Booka Shade’s signature hypnotic production style - textural atmospherics, choppy synth arpeggios and wandering, resonant bass tones alongside a bumpy rhythm. "We met Kaktus at a festival in Ireland last summer where he played with his band, and when we talked it turned out that as a student he had been to our first show in Iceland, which by coincidence took place in Björk's former school." 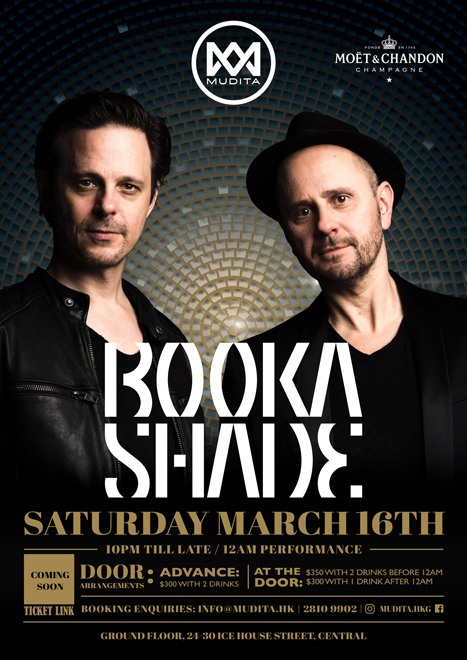 Booka Shade ft. Kaktus Einarsson’s ‘I Go, I Go’ is the first in a string of releases in 2019 which will be collated into a collection of songs and released via the label in September 2019.